Dubai: Search giant Google has created a "doodle" to mark the United Arab Emirates' 47th National Day on Sunday, December 2. A click on the doodle is linked to the day's top search result in the UAE: "2 December, National Day 2018 in United Arab Emirates." 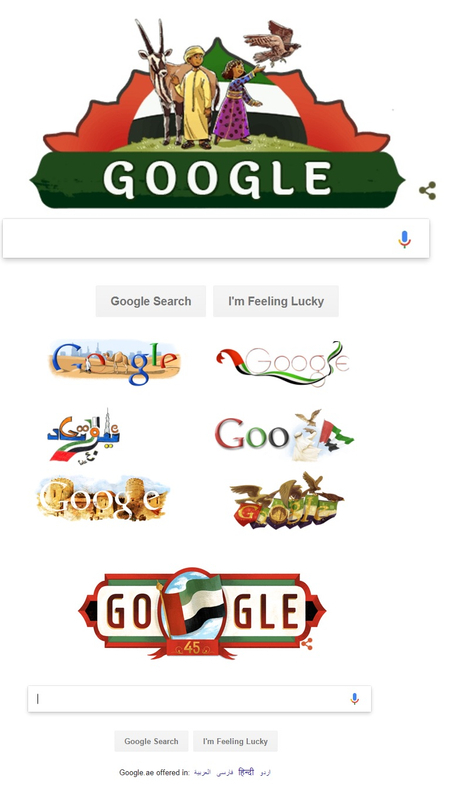 For the last several years, the Google has marked the UAE National Day with doodles showing images representing the country and its national colours. On 2 December 1971, six of the seven emirates entered into a union called the United Arab Emirates. These were Abu Dhabi, Dubai, Fujairah, Sharjah, Ajman, and Umm Al-Quwain. The seventh, Ras Al-Khaimah, joined the union in early 1972. Nearly five decades since, the UAE has become known for pioneering initiatives in various fields — including science, renewable energy and diplomacy — that have earned for the country wide acclaim as the "Switzerland of the Middle East". On Saturday, December 1, 2018 the UAE passport officially became the world’s powerful, with 167 countries now allowing Emirati passport holders entry without prior visa approval, surpassing Singapore, with 166 countries. On October 29, 2018, the UAE has launched a 100% locally-developed earth mapping satellite, called Khalifasat, now one the most technologically-advanced remote sensing observation satellites. What do you know about Emirati food? Manufactured and tested in the UAE, the satellite has five patents, making it an icon of technological advancement in space technology. The Emirates has also sets its sights on Mars, with plans afoot to build a new city on the Red Planet. The UAE has also earned plaudits for its high-tech manufacturing — making advanced components for the Boeing 787 'Dreamliner', for example. It is active in renewable energy. Abu Dhabi, the UAE capital, hosts the International Renewable Energy Agency, Irena. Today, the leadership vowed to pursue future technologies, driverless transport, artificial intelligence, and recently, cryptocurrencies to settle transactions. The UAE plans to build a new city on Mars, too, which international news organisations like The Washington Post have lauded as a "practical" option.